A collection of choice science writing is up at Kind of Curious, now hosting the Scientia Pro Publica carnivale. Some wonderful thought-provoking posts this time; and one rambling piece about the historiography of fish sticks or something? Go take a look. Circus of the Spineless #46 is up at Adventures of a Free Range Urban Primate. Go check it out! microecos is in the throes of a minor traffic surge thanks to generous links from two of my favorite writers/bloggers. Last week, Darren Naish picked up the Triassicist mantle with the first in a series of posts about everyone’s favorite herbivorous hellasaurs, the rhynchosaurs. Which reminds me, I better get that thalattosaur post up before I get scooped. Tet zoo readers who’ve wandered here in search of Triassic hellasaurs are encourage to hunt around…there are many hiding in the morass. Then, I discovered this morning that Chris Clarke has been kind enough to include my post about Arrow Canyon in the first edition of the Carnival of the Arid over at Coyote Crossing. It’s an amazing collection of desert-themed writing, ranging from poetry to the Pliocene, I highly encourage microecos regulars to check it out. Those who’ve arrived here from Coyote Crossing might enjoy this tale of urban geology that touches on some the temporal and spatial themes that underlie the Arrow Canyon piece. A. S. Romer vs. Kronosaurus – photo Walter Sanders 1958. Traumador has the latest issue of the Boneyard – #26 “My Favourite Museum” — go check it out! Visit the 3D museum. Pan. Rotate. Zoom. Enjoy. If you are interested in donating your own 3D fossil scans to the collection drop me a line. The latest edition of the Boneyard is up over at The Other 95%! Kevin did a great job highlighting the inverts this time around. 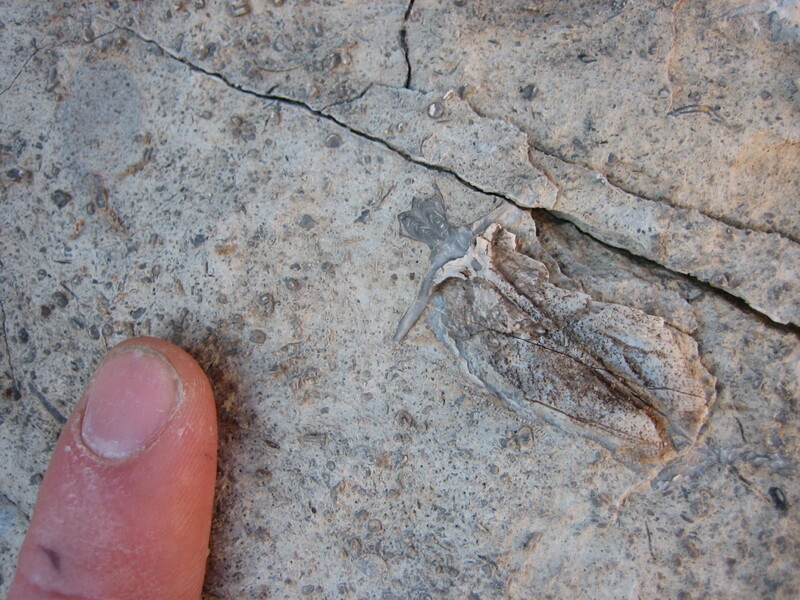 Will Baird’s excellent, expansive essay on Carboniferous ecology competitively excluded my own Carboniferous ramblings, but here’s a mystery Arrow Canyon fossil as a consolation prize! Anyone have any clue what this is (no, not the finger)? Props to Amanda, the Self-designed Student, for emerging from the national tryptophan coma long enough to compile the decamerate edition of the Boneyard. It yawns under the astonishing mass of recent sauropod-o-mania and I’m honored to provide the fossil-impregnated foundation. Okay, apologies on the local estivation…I’m hard at work on a top secret project.